This happens every year. A new year is starting and so that means that it's a new opportunity for you to create meaningful and lasting change in your life. But how do you increase your chances of actually meeting your New Years Resolutions this year? The problem hasn't been you, your motivation, or your behavior. The problem has been your goal. 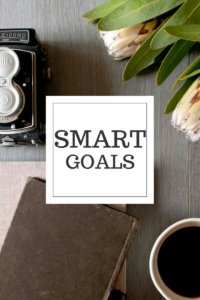 As a therapist working in publicly funded mental health for over eight years, I can tell you that one of the first things we learn is how to create SMART goals. We learn how to set our clients up for success by following this simple recipe in order to create achievable and attainable goals. I will share this secret with you so that you can use it to create SMART New Years Resolutions. S stands for specific. This means that your goals should have some details in them. Try avoiding vague goals like "losing weight", "working out", or "living a healthy life". These are all not specific enough. Think about what these things mean to you and create a goal that is more specific such as "lose 5 lbs", "go for a run", or "eat more vegetables". M stands for measurable. This means that your goal needs to be something tangible that you can actually measure. Try to avoid things like "be happier", or "be less sad" and instead focus on the things in your life that would let you know that you are happier or less sad. For example, "spend more time with family", "laugh more", or "cry less". These are all behaviors that you can actually see and measure. A stands for attainable. This means that your goal needs to be something that is actually humanly possible for you to reach. Try avoiding things like "create a fortune 500 this year", or "run a marathon each week". You know yourself best and you know your abilities best, so create a goal that you know you can actually reach. R stands for relevant. This means that your goal should actually be something that YOU want. Try avoiding creating goals that other people want for you and instead take a look at your life and decide what YOU actually want to change. Try to avoid weight loss or health goals if those aren't actually that important to you and focus instead on goals that actually are. T stands for time-based. This means that your goal needs to have a time interval in it. Try to avoid things like "go to the gym", or "go out" since they are not time-based. Instead create a goal that has a specific time interval in place such as "go to the gym 3 times this week" or "go out with a friend at least once this week". Follow these steps to amend your New Years Resolution and you will create a SMART goal that you will actually be able to reach. As a result, you will feel more empowered and successful in your life. If you need help in creating your SMART goal and you live in Illinois (Chicago, Joliet, Naperville, etc...), California (Los Angeles, San Diego, San Francisco, Santa Barbara, Sacramento, etc...), or outside of the USA please feel free to book an online therapy session.